With the arctic ice flows melting and the oceans rising because of climate change, we should call April 4-10 Hey, Wake Up and Pay Attention to the Ocean Week. Needless to say, the oceans are vital to the planet’s survival. They have also been vital as subject matter in art since the artists of ancient Egypt and Crete painted walls with scenes of marine life. 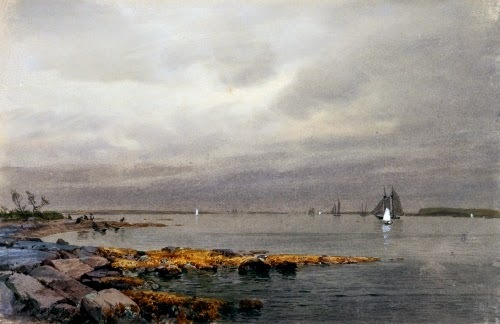 Of the many artists who specialized in painting the many moods of the ocean, I like the Dutch Baroque painters first and William Trost Richards a very close second. If I were locked in an empty room with nothing but a Richards seascape to look at, I’d definitely be happy as a clam (the pun stays). Richards was born in Philadelphia, and most of his life, between numerous trips to Europe, he spent winters in Pennsylvania and summers in Newport, RI. He had little formal schooling, but studied briefly with a landscape painter. He initially worked as an illustrator and designer of decorative metalwork, but early on his interest was in landscape. 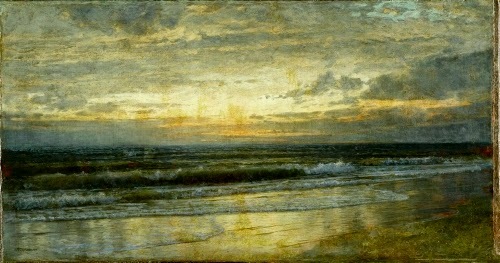 He first exhibited with the Pennsylvania Academy of Fine Arts in Philadelphia at the age of 19. At 21 he was introduced to the Hudson River School artists and his lifetime devotion to landscape was confirmed. Between 1854 and 1869 he honed his skill at landscape by doing incredibly detailed drawings of elements of nature. Richards’ many trips to England starting in 1855 exposed him to the Pre-Raphaelite artists there. The Pre-Raphaelites eschewed the theatrical painting of Romanticism and emphasized the realism of late medieval and early Renaissance painting, before the bombastic painting programs of the High Renaissance in Raphael and Michelangelo. In America, Pre-Raphaelite painters abandoned legendary or religious subjects favored by their English counterparts for extremely detailed paintings of nature. Their work was influenced by the writings of the English critic John Ruskin (1819–1900), who advised artists to follow nature as closely as possible to produce art that was transcendental. Richards avoided the large, often exotic landscapes of the Hudson River School artists in favor of intimate views of nature. He is often named as a member of the White Mountain School because of his many landscapes of New England. The integrity of his realism in nature got him elected to the National Academy in New York in 1862. After the Civil War (1860–1865), taste for the Hudson River School’s romantic-realist views of nature waned. 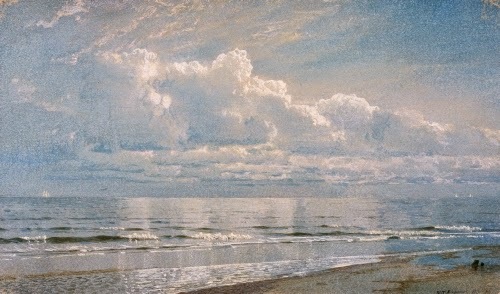 After 1870, Richards concentrated almost entirely on views of the ocean in every conceivable type of weather. 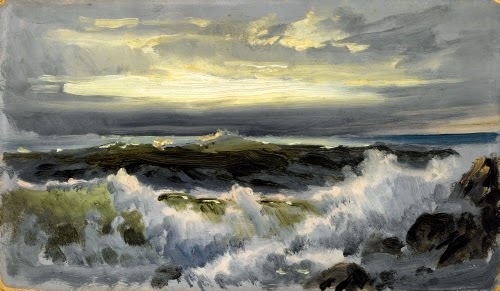 He spent hours wading into the surf to do detailed studies of the waves and effects of light on the water, often producing watercolors, such as Thunderheads at Sea: the Pearl, which he translated into oils on canvas in the studio. This Thunderheads at Sea very much reminds me of Dutch Baroque seascapes with its low horizon line and dramatic, dominating cloud formations. It is very clear to see in Richards’ works the power of nature and the reverence the Pre-Raphaelites had for it, and how, in their minds, nature summed up the existence of the divine.